This month’s Querent is a woman we will call Maria. Maria writes that she has recently undergone many significant life changes, sending her on a very different path than she had planned. She states that she is trying to regroup and move forward but faces numerous unknowns related to the future of her career and other personal goals. Having gone through a lot of upheaval, Maria sums up her numerous questions in a general request to try to learn what she needs to understand about the situation she is in, so that she may use these circumstances to the best possible resolution. Three cards are drawn from the Fairy Tarots, these are the Three of Hearts, Knave of Acorns, and Nine of Bells. First off, it is worth noting that while Maria is overwhelmed by numerous life changes the cards drawn are minor arcana. This suggests that the larger implications of the changes at hand have been understood. Maria is asking what more she needs to understand about this situation and it seems that she has already gained insight into spiritual implications of what transpired around her, yet needs to understand the finer details in a mundane sense in order to make the most of her circumstances. 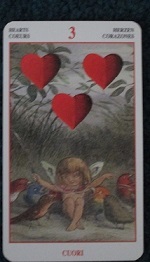 The Three of Hearts suggests unity, joy, celebration and support among friends. It bodes well for expansion of loving social relationships and shared happiness in a family or group setting. It suggests the opportunity has arisen for Maria to attend gatherings where others are joining together to celebrate and share their joys and sorrows, finding support and becoming uplifted through their emotional bonds to each other. Although life may have been difficult recently it would appear this is changing, and Maria is in an optimal position to appreciate her connection to others on a deeper level. More emphasis on friendships and family support are arising now and this may be a prime opportunity to slow down and focus on cultivating a more loving, nurturing bond with close friends and family. It also seems likely that a celebration or party of some sort is on the horizon and that this will bring emotional happiness and relief. Celebration is a key element here and it seems Maria is going to find opportunities to express gratitude and experience happiness, a “full cup” that necessitates sharing with others. The focus now is on healing through emotional expression and connecting in small group settings. Presence in family activities, social gatherings and support groups may be indicated at this time as well. There is an indication of finding her place among peers as well, neither dominating, nor subservient. Maria will encounter situations that represent a homecoming, finding her place among friends and sharing in emotional ups and downs with more mindfulness and greater empathy for others. The Knave of Acorns follows. 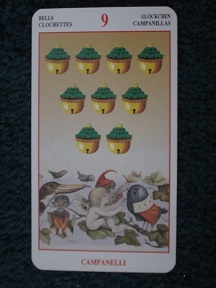 This card is unique to the Fairy Tarot deck as Acorns are not a traditional Tarot suit. It suggests that difficulties have brought a harsh winter from which the character has become sturdy. It is a mix between the energies of traditional swords (hardship/vitality) and pentacles (sturdiness, practicality) from traditional decks. Maria has experienced loss and hardship which have driven her motivation to succeed and provided insight into her greater strengths. Nonetheless she is starting out as a relative novice in new territory, one which requires greater resilience and determination than she has had to exert before. A new practicality and sensibility are emerging and it is likely that while Maria will come to appreciate the role of social supports more now, she will also have a firm ability to remain grounded and not be heavily influenced by raw emotion. Change is on the horizon and through Maria’s diligent efforts and strength of character she will be forging ahead and entering into new business ventures. Her career may be altered slightly, building on past experience and taking on more advocacy and service in a field that draws out the strength she has gained from loss and changes of the recent past. It would appear she will have the opportunity to embark on a crusade in service to others. Incremental progress is also indicated, gradual development and intermediate gains as she grows into this new role. Growth on a more polished and professional level is ultimately indicated by the Nine of Bells. It seems that while Maria is experiencing the growing pains of exploring change in her career and how she expends the energy of daily life, uncovering potential strengths and skills refined by recent trials, she will have the opportunity to glean profit financially and in terms of status from the change in her outward and career focus. It appears that Maria will be building up an abundance of material wealth compensating for losses that have occurred and giving further material comfort. It seems that a new way of allocating energy and a new purpose with career will help Maria establish a more comfortable living for herself and her family. She may also be “grandmothered” or eased in to a new position or new career path by those with experience, thereby “inheriting” greater status professionally, or new work opportunities altogether. This does not seem to imply an outright new job or career, but a new development based on her existing foundation, one which presents a heightened, more refined status to the public image and also provides more comfort and abundance personally. In the short term, it seems that Maria is being called upon to increase her awareness of the importance of social and emotional connections, to nurture emotional needs in a mutually beneficial setting and to take advantage of family and social gatherings, parties and positive, joyful events that help redirect her focus away from past stress and losses. In the mean time it seems that opportunities to further advance or develop skills born of conflict and loss will bring an important change in focus that will allow Maria the opportunity to convert painful experience into personal wisdom, assisting others in the process. The ultimate outcome seems to be a gain both in finances, security and status, with a shift in priorities that emphasizes personal joy, relationships, happiness and an ability to thrive even under difficult conditions. Best of luck to Maria as spring awakens new beginnings and opportunities for greater understanding. Remember, no matter where you are reading this readings are intended for entertainment purposes in accordance with NYS law. 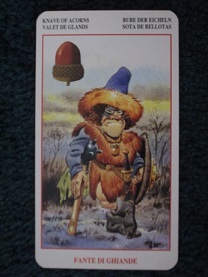 This month’s deck is the Fairy Tarot, created by Lo Scarebo and published by Llewellyn in 2000. For more on this deck, visit http://www.llewellyn.com/product.php?ean=9780738700069.